Samba in Lituya Bay. 12,000 foot mountains in back. Scars from tidal wave at 1700 feet. This, the greatest recorded tidal wave ever, happened when a large part of a mountain fell into the bay. "I cruised on the Samba in the summer of 2014 for a week and I can attest to the very comfortable living quarters and attention to passenger comfort undertaken by Captain Tofield. However, the principal positive element to me was the incredible focus on safety and the tremendous wealth of knowledge of seamanship and experience in Alaskan waters Captain Tofield brings to the experience. No trip of this nature in these incredible waters is without risk but Captain Tofield was always planning three days or more ahead to ensure we always had a safe and comfortable anchorage despite some inconvenient weather conditions. The Alaskan marine environment is not a place to trust yourself to an inexperienced or unseasoned host or skipper! Cruising with the Tofield's will be an incredible lifetime experience and a guaranteed safe one as well." We would like you to enjoy a safe adventure aboard our vessel. Even if you have not done much boating in the past, this guide will help you understand our boat, procedures and operation. Safety at sea is always our first consideration. We have brought over 40 years of experience to outfitting and preparing SAMBA . Bring a flexible , positive attitude to a challenging environment, the waters of Alaska, and we are certain you will have a rewarding time with us. 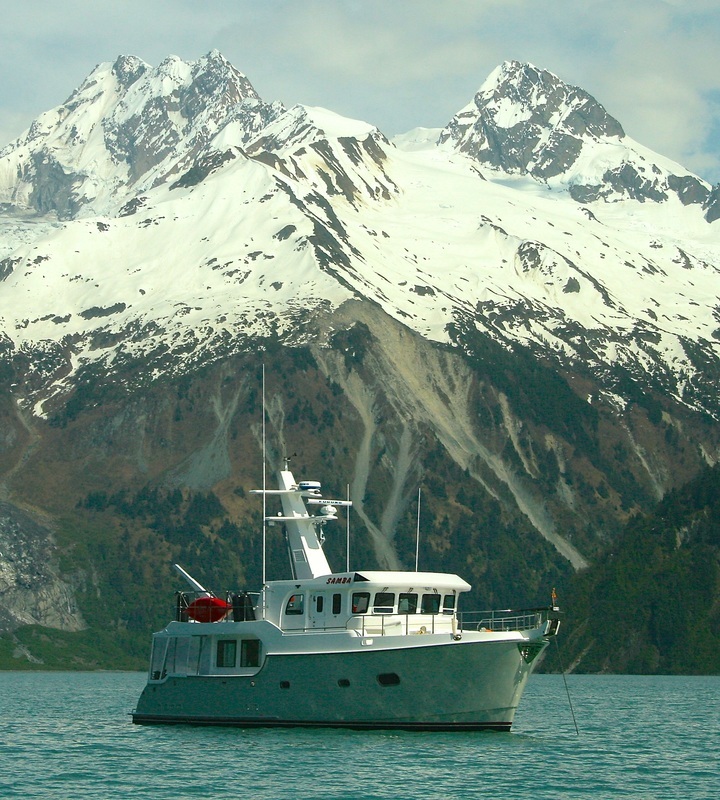 The Captain and First Mate have been exploring the waters between Seattle and Dutch Harbor from 2005 to 2017 and have traveled over 30,000 miles to over 450 different anchorages. The Captain has sailed over 60,000 miles and holds a US Coast Guard 100 Ton Master’s License. We have a complete complement of radar and navigational gear. Communications include VHF ( short range) and SSB (long range) radios , EPIRB emergency rescue beacons, and a satellite telephone. There is a life raft, an inflatable dinghy with a 20HP outboard engine, two kayaks and survival suits. Both inflatable PFD's and the standard models are aboard. We will have a safety briefing the first day aboard. We will explain survival gear and emergency procedures. ALWAYS wear a life vest while on deck or in the cockpit while underway. ALWAYS tell someone you are going on deck or to the cockpit while underway. ALWAYS hold on to something. The sailor’s maxim is : ” One hand for yourself, one hand for the ship.” Boats move, roll and pitch unexpectedly. Use the rails and handholds inside the boat. We are in country where there is a chance of a bear encounter. We will instruct you in bear safety and will always accompany you ashore when out of port. NEVER put your hands, arms or feet between our boat and the dock or another solid object. The greatest risk at sea is falling overboard. Unexpected motion and seasickness can cause one to tumble, although with the high bulwarks and Portuguese bridge the Nordhavn will give you a great sense of security on deck. The water temperature is in the 40’s and there is a high risk of death if one falls overboard. DO NOT FALL OVERBOARD!! ​ a. Pack your clothes in a duffle bag or frameless backpack. Please do not bring regular, non-collapsible luggage. b. Favor clothing made of polyester fleece for outdoor hiking and deck wear. It keeps you warm even if wet. A warm watch hat will be welcome. c. Rubber boots for wading ashore from the dinghy and hiking in wet conditions. They should be calf high. Xtra Tuffs are known as Alaska slippers.Readily available in Kodiak. Another good brand is Grundens. d. A good rain jacket and pants. e. Medications you take plus an extra week supply in case of weather delay. f. Polarized sunglasses make it much easier to see on the water. i. indoor shoes like Crocs or moccasins. You may choose to be going into the engine room and will need non slip soles. Almost everyone gets seasickness under some set of circumstances, some more than others. Get your medication and patches. If using patches, put one on the night before leaving port. Eat and drink modestly the night before. Early signs of getting sick are yawning, sweating, feeling weak, fearful and tired. Tell us right away if you don’t feel well. Fresh air, concentrating on the horizon and talking to others may make you feel better. Lying down in the aft salon with eyes closed can also help as does staying well hydrated. If you have to vomit, do so in a bucket not in the toilet or sink. Throwing up in the cockpit is better than trying to hang over the edge (risk of falling over). Everything we use is carried with us . Conservation is part of boating. Toilet: The marine head is treated with respect. The Tecma toilet is superb, but use ONLY the special toilet paper we have. Put NOTHING in the toilet except for human waste and this toilet paper. Stowage: A boat moves around so please put everything you use away or it may get thrown around, break, or scratch the furnishings. Check that items are stowed before leaving the anchorage. Make sure portholes, hatches and cabinet doors are latched. Water: We'll show you how the water system refinements work. Besides the 400 gallon water tank, we have a watermaker on board, and three different systems for heating water. Federal regulations prohibit illegal drugs of ANY kind aboard. International regulations prohibit garbage disposal except as per the boat’s waste disposal plan. Oil and plastic are NEVER thrown overboard. Loxie, a 60 pound Yellow Labrador Retriever, lives aboard with us. She is very gentle and friendly. She does shed. We will happily teach you as much as you want to learn about the boat and navigation. We welcome you joining in doing engine checks, raising the anchor, launching the dinghy or any of the usual parts of cruising. a. Tell us in advance of any food allergies and any strong likes or dislikes. b. Everything we eat needs to be stowed in advance, except for the fish we catch. No stores or markets once we leave port. c. If you want to fish you will need to purchase an Alaska fishing license for your time aboard. This can be done in Kodiak or online. d. Alcohol is to be enjoyed in moderation once we anchor. The wildlife of Alaska is on full display . We have nature identification guides aboard. Binoculars are available for your use. There is a DVD player, TV screen and a variety of movies available. We have two kayaks aboard for your use. Except in the immediate area of port we are rarely in cell phone range and almost never in area of Wi Fi internet. For emergency calls we have a satellite telephone . Occasional e mails can be sent via a special Iridium satellite telephone service. Plan on this being a break from shoreside concerns. The only way to enjoy Alaska is to get out and see what’s there. We have a rule aboard: “Never complain about the weather. It is what it is.” However, we will not navigate into conditions we feel are dangerous. This could mean spending time holed up in an anchorage waiting for better weather. If you want to do some fishing you will need to purchase an Alaska State Fishing License for the time you are here. This is best done in advance on line. We have excellent fishing gear and are set up with two downriggers for trolling for salmon. Many airlines fly to Anchorage including Alaska Airlines. Only Alaska and Ravn fly from Anchorage ( ANC) to Kodiak (ADQ). In the summer , occasional fog can delay flights to Kodiak. We suggest you plan on coming a day or two before your charter starts and/or allow time at the end of your charter. There is lots to see and do. We can suggest accommodations and activities for you. SAMBA has a slip in the St. Paul's ( "Downtown") Harbor steps away from the Best Western Hotel. See the Links tab for more info. We hope that this brief introduction will remove surprises from being aboard, except for the surprises of seeing bears on the beaches with their cubs , whales leaping from the water , eagles diving to fish, and you pulling aboard a prize salmon. We look forward to seeing you.